She later moved to Dublin, where she studied drama at the Gaiety School of Acting. After a season at the Gaiety, Aoife was invited to do a tour of Australia. There she performed at festivals and concerts sharing the stage with some of Ireland's greatest performers, including Christy Moore and the Furey Brothers. Her performances also include a Caribbean cruises with the Clancy Brothers, the Milwaukee Irish Festival and a seven week tour of the United States with the renowned Paddy Noonan Show. In 1995 Aoife was asked to join the acclaimed group "Cherish the Ladies", which is one of the most sought-after Irish American groups in history. For the past four years Aoife has toured extensively doing no less than two hundred dates a year throughout the United States and Europe. She has been a featured soloist with orchestras such as the Boston Pops and Cincinnati Pops and ,while performing with Cherish the Ladies, collaborated with the Boston Pops on their Grammy nominated Celtic album. Aoife has done six recordings in the last two years, three of which are under RCA Victor. She has also recorded two solo projects "Its about Time" and "Soldiers and Dreams" on Rego Records . On her debut CD " It's About Time," Aoife presents some traditional favorites, such as "Factory Girl" and "Mrs. McGrath," but she also presents a sassy rendition of Leon Russelson's "Don't Get Married Girls." As one reviewer remarked, "she has a breadth of styles that make her concerts fascinating. Her singing would melt packed ice with it's warmth and richness" - Mike Jackson, Canberra Times. 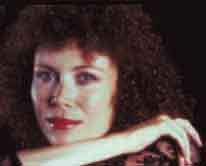 On Aoife's second Rego solo album, "Soldiers and Dreams," Al Riess, from Dirty Linen magazine, wrote: "Solders and Dreams has a contemporary-meets-traditional-music feel and Clancy's smooth, expressive singing works both ways- ensuring a successful merger of the two approaches and an enjoyable listening pleasure". Currently, Aoife is touring with her own band in support of her two Rego solo releases. When she comes to a town near you, be sure not to miss this totally enchanting performer.